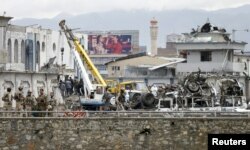 FILE - In this April 19, 2016 file photo, Afghan security forces inspect the site of a Taliban-claimed deadly suicide attack in Kabul, Afghanistan. Blamed this attack in Kabul, the Haqqani network, declared a terrorist organization by the United States, is on the ascendency within the Taliban, uniting disgruntled warriors and bringing military cohesiveness to the battlefield raising fears that the summer fighting season will be ferocious. Officials in Afghanistan say the State Department designated terrorist group, the al-Qaida linked Haqqani network, has effectively taken over battlefield command of the Taliban insurgency. Haqqani militants allegedly operate from sanctuaries in neighboring Pakistan and are known for staging high-profile suicide assaults on Afghan and international forces. 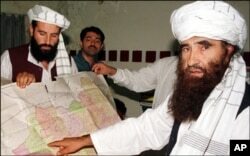 “The Taliban are currently being commanded by [the] Haqqani [network]. We believe Haqqani and al-Qaida are two different names for the same terrorist organization,” Interior Ministry spokesman, Sediq Seddiqi, told reporters in Kabul. He said Afghan security forces military strategists are aware of the terrorist threat and dealing with all of them as a common enemy of Afghanistan. U.S. and Afghan leaders have long alleged the Haqqani network has ties to Pakistani military-intelligence. The group has fought along side the Taliban in the 15-year Afghan conflict, but mostly operated independently, until last year when its fugitive chief Sirajuddin Haqqani was named deputy to Taliban leader Mullah Akhtar Mansoor. FILE - Sirajuddin Haqqani, far left, and Jalaluddin Haqqani, far right, then Taliban Army Supreme Commander, meet with reporters in Miram Shah, Waziristan on Aug. 22, 1998. Officials at NATO’s Resolute Support mission in Afghanistan last week also warned of the Haqqani network, describing it as “the most lethal” and “most competent" terrorist organization in the area. “Siraj Haqqani, has been named the number two for the Taliban. And we think that he is increasing really, his day-to-day role in terms of conducting Taliban military operations,” says U.S. Army Brigadier General Charles Cleveland, deputy chief of staff for communications for NATO’s Resolute Support mission in Afghanistan. FILE - NATO soldiers walk at the site of a suicide bomb attack in Kabul, Afghanistan, June 30, 2015. “And we think that he is trying to exert more influence really, on the leadership with some of these shadow governors in some of these other places [in Afghanistan],” Cleveland noted. But he underscored concerns about the Haqqanis branching out from their traditional area and then focus on high profile attacks like the one that killed nearly 70 people in Kabul last month. The Haqqani network’s growing role is likely to fuel Afghanistan’s tensions with Pakistan. Kabul has consistently pressed Islamabad to crackdown on the group, claiming it has evidence showing Haqqanis were behind the April 19 deadly bombing in the Afghan capital. Afghan security forces inspect the site of suicide car bomb attack on a government security building in Kabul, Afghanistan, April 19, 2016. Pakistani officials dismiss allegations the network is still operating from their territory. A senior foreign policy aide to Prime Minister Nawaz Sharif last week urged Afghans to share the evidence, saying Islamabad’s probe into the violence has established it had nothing to do with it. 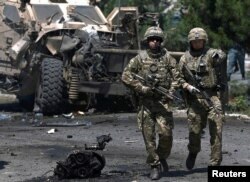 Despite emerging new security challenges, Afghan officials claim their forces have inflicted heavy casualties on the insurgents since the Taliban launched its so-called spring offensive last month. Kabul’s ambassador to Islamabad, Hazrat Omer Zakhilwal, tells VOA the battlefield successes have boosted moral of Afghan forces, which have received far less casualties than the previous fighting season. Afghan officials say U.S air support has been sought in certain cases, but foreign troops are not involved in ground combat. Cleveland says about 75 percent of the Afghan Special Operation Forces missions are conducted independently, with no coalition assistance whatsoever. "Out of that remaining 25 percent, a percentage of that, we're not going into the field with them, we're just essentially helping them with the planning and intelligence and advising and those types of things," he said. Independent Western security experts like Ted Callahan, who is based in northern Afghanistan, also agree with Kabul’s assessment of the fighting. Callahan says support from international forces has played a key role in operations Afghan National Defense and Security Forces have conducted, particularly in northern provinces, including Kunduz, which the Taliban had briefly overrun in 2015. “I would say the mood of the local population is much more optimistic than we have seen for several months previously. But at the same time the question is how sustainable is this current model, because if you look it is really dependent on having international forces and their assets present,” said Callahan. Afghan forces have intensified counter-insurgency operations after the April 19 Kabul attack that officials blamed on the Haqqani network. A Taliban spokesman, Zabihullah Mujahid, has dismissed as propaganda claims the insurgent group has suffered massive casualties and failed to achieve its objectives. “Our spring offensive is not a week long or a moth-long activity. It is a full one year operation and our mujahideen will prevail as they did last year,” Mujahid asserted. Analysts believe the intensifying Afghan conflict means further deterioration of the country's relations with Pakistan. A four-nation process, involving the United States, China, Afghanistan and Pakistan, to promote talks with the Taliban as well as Kabul's normal ties to Islamabad are now "practically hostage" to Afghan expectations of a direct Pakistani action against the Haqqani network, says an Afghan presidential aid, speaking to VOA on condition of anonymity.